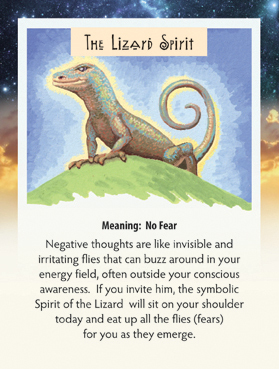 This week we have again drawn the Lizard Spirit card. Note that it is the spirit of the lizard, not an actual lizard that inspires fear in some. This is quite the opposite. I was “introduced” to this spirit many years ago as he symbolically sat on my shoulder and identified and captured negative thoughts that were flying around me like flies buzzing around my head. Many times we aren’t even aware of those negative thoughts, which is why this guy is so very helpful. You don’t have to identify each fly! Just ask for the help and the work will be done. It really represents a higher part of your own self that, when asked, will go to work for you. But you do have to ask…just ask and then let it go. Ask for help removing fears that are holding you back, keeping you from being as awesome as you are meant to be…as you really are! As part of that asking process, first connect with your higher self, and that can be as easy as visually putting the sun in your heart. Then ask that the help be for the highest and best good of all. In doing that, you are as safe as a person can be and getting help from the highest sources possible! So, be not afraid…give it a try!